simplifies power-supply design for FPGAs, ASICs, microprocessors, DSPs, and other point-of-load conversions in communications, test and measurement, and industrial systems. A complete power system, the ISL8203M includes a PWM controller, synchronous switching MOSFETs, inductors, and passive components in a single package supporting an input voltage range of 2.85 V to 6 V. It boasts high efficiency of up to 95% and 15°C/W thermal performance. The power device is capable of delivering 6 A at 85°C without the need for heat sinks or a fan. Other features include internal digital soft-start, enable for power sequencing, over-current protection, and over-temperature protection. 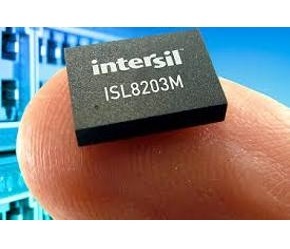 The ISL8203M is available now and costs $5.97 in lots of 1000 units. An evaluation board, designated the ISL8203MEVAL2Z, can be purchased for $67. Find more datasheets on products like this one at Datasheets.com, searchable by category, part #, description, manufacturer, and more. Don’t miss out on the latest products. Subscribe to EDN’s weekly Products & Tools newsletter (free registration) for the latest product announcements and news.